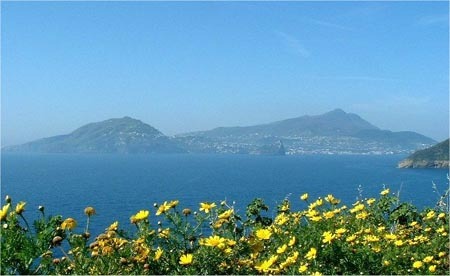 In the island of Ischia, home of the puttanesca spaghetti sauce locals have many seafood and fish recipes. However here is one of the few Ischian dishes that isn't made with fish: the Ischian meatballs. These meatballs are made with a mixture of ground beef and pork, in addition to pine nuts and raisins. The twist here in this recipe is that after being fried in oil they are cooked in a tomato sauce. A delicious specialty from this exotic and enchanting Island. In Ischia there also is the "cuoccio di pane cafone" would be translated into a loaf of bread, with the interior removed out of his bread. Obviously you must have a type of bread with a thick crust and a bit stale; which you will fill the loaf with the meatballs described here. In a bowl, put the bread crumbs first and soak them in milk for 10 minutes; discard excess milk. Then add the minced beef and pork and mix. Add the eggs, the previously soaked raisins, pine nuts. Mix everything well. Add salt, crush in the garlic with a press and add also the parsley, the cinnamon and the grated cheese. Once mixed thoroughly, shape the meat mixture into meatballs about 2 inches in diameter and fry them briefly in the hot canola oil. If the mixture is a bit too soft and moist, add more bread crumbs to the meatballs before frying them. Prepare the tomato sauce in a skillet; first fry the chopped onion. Next, pour the tomato sauce and tomatoes over and cook. Make sure your sauce does not get too thick by overcooking it! Add the meatballs to the pan and cook them in the tomato sauce for about ten minutes, for them to take the tomato sauce taste. Sprinkle with basil to garnish and serve. Serve this outdoors, surrounded by good friends and a few nice bottles of Ischian wine!